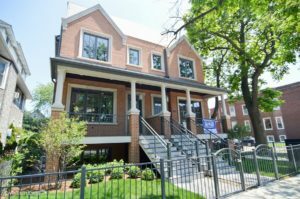 New construction single family Rowhomes. This brick and limestone home located in coveted Bell School District has 5 bedrooms, 3 1/2 with transitional finishes throughout and a fantastic layout. 3 large bedrooms, 2 baths and a laundry room conveniently placed on the 2nd floor. The 1st floor, has an elegant formal living and dining room complemented in the back of the home with a large great room with a fire place, mud room with built-in lockers, butler’s pantry, professional kitchen with high-end stainless appliances, 2 pantries, desk area, and an extra-large island. Radiant heated floors in lower level and in stone bathrooms. Large family room in lower level with full wet bar. All closets are fully finished. Ideal outdoor space with covered front and back porches, yard, and 2 car garage.